Tekkeon NavDock for iPod: video helped the iPod star! 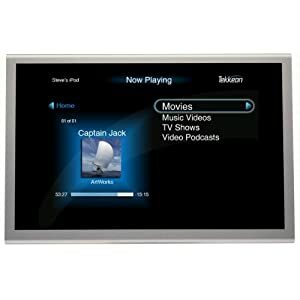 The Tekkeon NavDock Home Media Center with On-TV Navigation for iPod/iPhone lets you navigate your iPod/iPhone through an on-TV menu to play videos, photos and music on a connected television. The Tekkeon NavDock browses directly through your iPod/iPhone menus, so finding and playing music and videos is easy. You can use the 16-button remote to adjust or mute volume, shuffle, repeat or skip songs, and fast forward or rewind through music or videos. The remote offers a five-way navigation pad and quick keys that jump directly to the videos, photos, music or settings menus. With Tekkeon NavDock , you have complete control. You can change the language, the menu color scheme to fit your mood, or the navigation speed to fit your taste. You can even access the equalizer or display the lyrics or album art that appears next to your songs in the Now Playing screen in motion as your personalized screensaver. The graphic display that appears on your TV is very nice, both aesthetically pleasing and easy to read, with adjustable color backgrounds. The remote gives you full navigation of your IPod: Playlists, Artists, Albums, Songs, Podcasts, Genres, Composers and Audiobooks. It also allows you to set your Equalizer just like on your IPod and basically shows about everything on your TV screen that your IPod display does. The display on the TV screen will show you what is currently playing and you can set the screensaver to come on after various lengths of time. The title of the current song always scrolls across the album cover area. Yes, it shows album covers! And you can turn that feature on or off; just like the IPod Classic it works a little faster without the album cover display turned on but I prefer to see the album covers. Anyway, it’s nice to have the option. 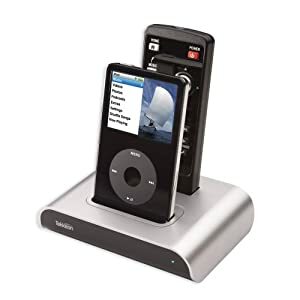 The NavDock will play your videos and photos as well, though with photos you have to first navigate using the IPod display itself, instead of using just the display on the TV to navigate. This is the only time you ever have to look at your IPod itself when you have the NavDock connected. Everything else can be done with the NavDock remote: you can browse artists, genres, and albums and one nice feature is that the remote has a shuffle button right on it, so you don’t have to go into the menu to turn shuffle on or off. You are currently browsing the archives for the Tekkeon category.